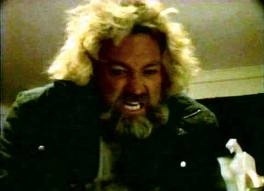 As for the cast, a lot of the appeal is that this stars Dan Haggerty, aka “Grizzly Adams” (“Grizzly Adams DID have a beard !!”). Honestly, he looks really embarrassed to be in this movie, and rightfully so. He robotically sleepwalks through the entire movie, but I probably would have too. The only other noteworthy actor (in my eyes) is Ken Carpenter, best known for his role in “Hellraiser 3” as the Camerahead Cenobite (“That’s a Wrap !”). Anyway, star studded cast. The movie is about a girl (and her friends) who hate Christmas and inadvertently summon a killer Elf who begins dispatching various terrible actors (including a coked up Santa Claus). It turns out her Grandfather is a Nazi who is also her father due to an incestuous plan to have the Elf impregnate her with its baby that will help breed a race of Nazi Super Elf Men. I’m not kidding. As you can tell, the plot is batshit crazy. I have to give it props for having such an ambitious plot, despite the fact that it doesn’t really work all that well. It seems ridiculous even saying that, I mean, apart from an increased budget I’m not sure how they could have pulled this off better. Well, maybe having more than one Elf in a movie called “Elves” would have been nice. Plus they call it a “troll” for most of the movie, but anyway. That said, the movie’s not without its charms. Probably the best part is when the main girl sits on Santas lap and is telling him what she wants for Christmas. Santa begins sliding his hand up her leg and whispers “Oral”. She says “What ?” and he utters the timeless line “Santa said … ORAL ! !” before promptly getting fired. Funny stuff ! 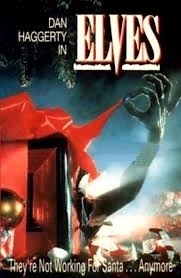 In the end, “Elves” just doesn’t live up to the insane premise it lays out before us. I can’t even say it’s in the “So bad it’s good” category. Or the cate-gory category. It’s amusing at times, baffling most of the time, mildly gory at other times, uneventful at most times. I guess I was expecting more based on the premise, but that says more about me and what I’ve come to expect/hope for/dream of with movies like this. On the plus side, Elf wearing a Santa hat is sort of fun, but he’s no Grizzly Adams ! This entry was posted in Reviews and tagged Christmas, comedy, cult, December, drunk, Elves, gem, gore, holiday, Horror, review, Santa, Xmas by lazron. Bookmark the permalink.